The Zookeeper: The World's Best Pet Barrier That Moves With Your Seats! The ZooKeeper: The Award-Winning Original! Tilt. Slide. Recline.™ The ZooKeeper is world's best pet barrier that moves with your seats. EASY to install in 2-door cars, 4-door cars, trucks with extended cabs, wagons and SUVs. No tools needed! Design allows seat movement and easy backseat access. Engineered in USA. Guaranteed to work with headrests and seats in ALL vehicles: 2-door cars, 4-door cars, trucks with extended cabs, wagons, and SUVs. Works great! I have had this for about one year. I bought it as soon as I bought my 2011 Lexus, as I knew I did not want my American Eskimo and all of his fur in the front helping me drive. Additionally, I have this paranoia about cargo hitting the passengers if there's an auto accident. Yes, it does rattle some, and my super-sensitive mother can pick the rattle up when I'm driving over rough pavement and talking to her on my bluetooth. But seriously, no one else does. I have never uninstalled this, and keep it up at all times-because you never know when your cargo may hit you in the back of the head! OK not really :) But I'm cautious. YAY! I feel safe bringing the baby in the car with the dog! This is a great product! The only thing is, I imagine if my dog were more of a chewer he would chew the elastic fasteners right off. For us this barrier is perfect. It's very easy to switch from car to car! Innovation at work! Purchased The Zookeeper recently and I could not be happier. It 100% works, looks good and its a cinch to install. My wife calls it nothing short of a miracle since everything else failed – we have 2 very jumpy Terriers: a Jack Russell and a mid-size 25 pound Catahoula. Now here's the clincher: my product came cosmetically defective, meaning, a rust spot in one of the components. I have emailed the company (Polar Fusion USA) and I was met only with courtesy, an apology and a prompt resolution by means of replacement. In this day and age of fraud and internet shopping, it is refreshing to find a company that is driven by innovation while standing 100% behind their product and supporting it with strong customer service ethos. Works great, simple design. The Zookeeper was a great investment. It was easy to install and it is easy to take down and put back up. Keeps our gymnastic 60 lb. lab puppy in the back. Is quiet and doesn't rattle when we drive. What a great buy! Effectiveness as barrier will depend on your dog. Worked great initially, but our 70 lb dog quickly figured out how to physically manipulate the barrier and get around it quite easilly. He quickly learned that all he had to do was pull down on the barrier enough to where he could create enough space to climb over the top. 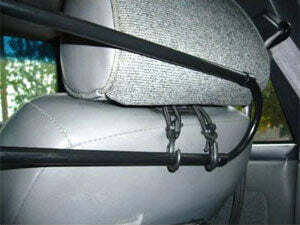 While the bungee cord attachment system provides the unique benefit of being able to independently move the front driver and passenger seats, it is also a weak point in this product's design for a dog that is willing to challenge the barrier and is strong enough to physically manipulate it. For smaller breeds that are less physically able to maneuver the barrier or for more docile dogs not inclined to try to test the barriers limits, this product would seem to be a good solution, but I wouldn't recommend it if you have a dog like mine. Expensive for what it is, but it works. We installed this in a 2009 Mazda 3 hatchback. It was very easy to install and stays in place very well. It does its job; keeping our three dogs in the back. The plastic clips don't give the impression that they will last very long, if you have the need to constantly remove and install the barrier. I would also like to have some type of rotational locking device for the slide out sides, rather than the cheap pieces of rubber that hold them in place. Considering what this product is, $80 ($90+ with shipping) is rather expensive, but it works. Saved my SUV! Silly me. I bought a new SUV and a new puppy around the same time. This puppy is a large 8 month old Doberman who was bought to be a companion to my medium size 70lb Lab. I've never had a dog with separation anxiety before so when I left them both in the car to do some grocery shopping I was upset, to say the least, to find damage to my car. He ate my windshield wiper lever, pulled the knobs of my stereo and other console buttons, chewed the leather off the gear shift, and chewed part of the leather off the steering wheel. After searching for weeks online and in the stores, I finally found this and think I may be able to save the rest of my SUV from Doberman damage. Since installing, he has eaten through the rear seat belts (sigh) but my front ones have been saved thanks to the Zookeeper. Awesome! This product is awesome and does just what it says! I had a slight issue with it at first -- one piece didn't want to connect to another--, contacted the company, was immediately issued a replacement -- at no shipping cost to me --, and was later sent a shipping label to return the first ZooKeeper. THAT is customer service!!! You couldn't ask for better customer service/satisfaction! Back to the product... it's simple, easy to install/use, easy to remove when needed, lightweight yet durable, and attractive. Works great with my 90 pound Golden Retriever! :) Thanks!!! Keeping Jake in the Back. Recently bought a Chevy Traverse after trading in a Dodge Magnum. The pet barrier we had in the Magnum didn't fit the Traverse well and we needed something that would allow us to take advantage of the flexible seating in the Traverse. The ZooKeeper was a great solution. Easy to install without damaging the roof liner or the storage area. Perfect size and it allows you to move seats around easily. 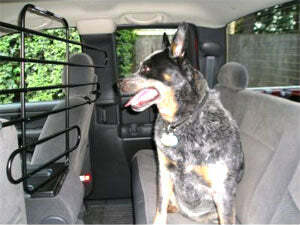 The shape is perfect for our SUV and now Jake stays in the back where he belongs." The best doggie car barrier/ pet gate. I have used several different kinds of pet barriers over the past few years, as I have 2 large Weimaraners, who if they had their choice they would be sitting in my lap as I drive. Anyhoo, this product is fantastic !! !It's light, easy to install (one person can do it),its easy to remove and store ...And the best part is that because it's attached to the back of the front seats, it also moves with the seats -There is nothing blocking the forward or backwards movement of the front seats. Another great things is that there are no little screws to tighten, or loose and it's so quiet !! No rattles or squeaking noises !!! If you've been searching high and low for that perfect doggie car gate/barrier ... then you've found it !! Enjoy !!! Great gate for rear of small SUV I did SO much research on dog gates before settling on this one, and I have to say that I'm not at all disappointed. Because this gate hooks onto the headrests of the seats, it doesn't have many of the same problems with staying in place that I saw on other models. I didn't like the all wire ones that looked too much like a cage. I heard that the netting ones were too hard to keep in place (double stick tape comes undone) and I heard mixed reviews on the trombone models with the tension mount. Many people complained that the tension mount was never secure enough. By bungee-cording the gate right onto the headrests, this one bypassed all those issues. We were able to adjust the bungees for a nice tight fit and it hasn't so much as wobbled since we set it up two weeks ago. I really like this one because the trombone style allows for great visibility, doesn't feel too much like a cage (passengers in the backseat can still pet the dog if they want) and it fits perfectly in our Honda CRV (a compact SUV). The directions suggest you can use this for the backseat of a car, but I think a crafty dog could crawl under between the seats if they tried. But in the rear section of an SUV, this worked perfectly! However, I must admit that this gate might not be for everyone, as we have several factors in our favor: our SUV is small enough that we don't have to slide the trombone peices out very far - and even with them tucked all the way away, our medium-large dog couldn't wiggle through if she tried. Also, our dog is very well behaved, and we have worked very hard to reward her for sitting in the back of the car. I left her in the car (in the shade with the windows cracked and water...) for about an hour while I ran errands, and she was perfectly content sitting behind this gate. Brilliant product! No more nose prints on the front windshield! This is a simple but ingenious product. The sides telescope like a slide trombone and it bungees in place around the head rests. It was very easy to install; after I figured it out it took about two minutes to adjust. It doesn't rattle or move and keeps my two 37 lb dogs in the back of my CRV. I've moved it into another car in just minutes. The price is good and the product really works. Nice! FINALLY SOMEONE HAS COME UP WITH A BARRIER THAT WORKS! Looked forever for the right barrier to keep my 3 JRT's in the back of my Equinox...finally bought the tension type with a door. Tough to install, the little terrorists could crawl underneath and make their way to the front. So started the search again, this one came, installed myself in about 4 minutes and it is absolutely the perfect barrier. No rattles while driving, dogs don't even mind it since they can still be close to the front seats and me. It is just how described too, moves with the seats, lighweight and looks good too. Highly recommend buying this one, you will love it and so will the dog(s)!" THIS PRODUCT IS AWESOME!! LOOK NO FURTHER FOR THE RIGHT BARRIER!!! This product is AMAZING! Like many of you I am sure, I searched and searched for the perfect barrier to keep my 95 pound 2 year old lab in the back of my SUV and out of my lap (which is where he thought he needed to be). After an exhaustive search, I bought one of the traditional, tension style tubular barriers from Midwest. let me tell you....IT WAS CRAP!! Not all of the pieces were in it, the bars slid everywhere and my dog quickly found out how to push his head through them on a 2 hour drive. When I found this barrier, it looked much easier. The other was a pain to put together and then even more of a pain to install in the car by myself. I put the zookeeper together in literally 40 seconds and then installed it in about 2 minutes (I had to figure out the straps which took all of 5 seconds). This is perfect....it moves with the seats just like it says, it stays in place (the other almost hit me in the back of the head when I stopped), and it keeps him in the back. I HIGHLY recommend this to anyone looking for a good barrier. It is incredibly light yet still does the job. It is a little more than some of the cheaper ones, but trust me when I say you get what you pay for. I LOVE this product and have recommended it to friends already. Buy it and you won't regret it!!!!!!!!"